Among the public overall, 50% approve of the way Barack Obama is handling his job as president, while 44% disapprove. Obama’s job approval is little changed from April (48%) and March (51%), when his job rating reached positive territory for the first time in nearly three years. Obama continues to draw strong ratings among African Americans (83% approve) and Hispanics (65%). Among whites, however, 39% approve of Obama’s job performance, while 55% disapprove. There is a sizable gender gap in Obama’s job ratings among whites. Just 33% of white men approve of Obama’s job performance, while 61% disapprove. White women are more evenly divided (45% approve, 49% disapprove). Views of the way Obama is handling his job as president are divided along party lines: while 84% of Democrats approve of Obama’s performance in office (11% disapprove), just one-in-ten Republicans say they approve. By contrast, fully 86% of Republicans disapprove of Obama’s job. Opinions of the Republican and Democratic parties have shown little change over the past year. Impressions of the GOP remain near historic lows: Just 35% have a favorable view of the Republican Party, while 60% view it unfavorably. Opinions of the Democratic Party are divided (49% favorable, 46% unfavorable). 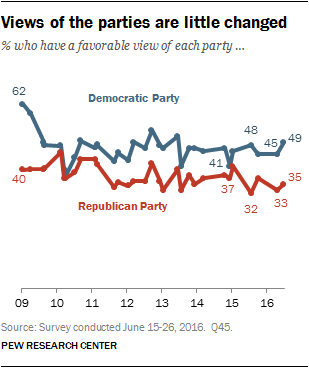 As was the case in April, Republicans have less favorable opinions of their own party than Democrats have of theirs. Currently, 69% of Republicans view the GOP favorably; by contrast, 85% of Democrats view the Democratic Party favorably. The Democratic Party has held a significant advantage in favorability over the Republican Party over the last six years. The gap narrowed in late 2014, shortly after Republicans won control of both the House and Senate, but a clear Democratic favorability advantage reemerged by the summer of 2015. Currently, 31% of the public views Congress favorably, while about twice as many (63%) have an unfavorable opinion. While views of Congress have been quite negative for several years, the current favorable rating is a bit higher than last September (27%). Majorities of independents (66%), Republicans (63%) and Democrats (62%) have unfavorable opinions of Congress. The public continues to have mixed ratings of the nation’s economy. Currently, 44% say conditions are only fair while a roughly equal share views them as excellent or good (27%) or poor (28%). These views have changed little over the last year, but there has been long-term improvement in economic attitudes. In June 2012, at about the same point in the previous presidential campaign, just 10% expressed positive views of the nation’s economy, while 42% described economic conditions as poor. Looking ahead, a majority of Americans (54%) say conditions next year will be about the same as they are now. About three-in-ten (29%) say things will improve over the course of the next year and 13% believe they will get worse. Optimism about economic conditions in the coming year is up slightly from March when 22% said economic conditions would be better a year from now and 17% said they would be worse. Republicans and Democrats continue to express differing views on the state of the economy. Democrats and Democratic-leaning independents are more than twice as likely as Republicans and Republican leaners to rate national economic conditions as excellent or good (40% vs. 15%). Partisan differences are more muted on expectations about where the economy is heading. Similar shares of Democrats and Democratic leaners (32%) and Republicans and Republican leaners (27%) expect things to improve over the next year. Few expect conditions to get worse and pluralities of both (51% of Republicans, 58% of Democrats) say the economy will be little changed. Most Americans (53%) say their family’s income is falling behind the cost of living. About a third (36%) say they are staying about even while just 8% say their incomes are rising fast than the cost of living. Majorities of those with family incomes below $30,000 a year (71%), and those with incomes between $30,000 and $75,000 (56%), say their incomes are falling behind the cost of living. Only about a third (31%) of those with incomes of at least $100,000 feel like they are falling behind. Among registered voters, there are wide differences in views of the economy among supporters of Trump and Clinton. A majority of Trump supporters (61%) say their incomes are not keeping pace with the cost of living compared with 47% of Clinton supporters. Even among Trump supporters with relatively high family incomes – at least $75,000 or more annually – nearly half (48%) say their incomes are not keeping up with the cost of living. 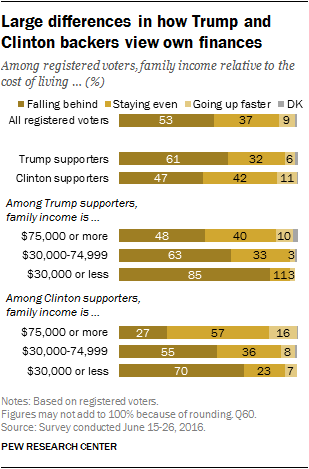 Among Clinton supporters with the same family incomes, just 27% say they are falling behind. As with views of the economy, the public’s perceptions of job availability have changed little in recent months, but are much more positive than they were a few years ago. Nearly half of the public (49%) says jobs are difficult to find in their community, while slightly fewer (43%) say there are plenty of jobs available. Views of job availability differ by age. Younger adults express more positive views of job availability than do older adults. Half of those younger than 30 say jobs are plentiful while only three-in-ten of those aged 65 and older say the same. Family income is also related to perceptions of the job market. Nearly six-in-ten of those who earn more than $100,000 (58%) express positive views of job availability in their communities, while only 34% say jobs are difficult to find. The inverse is true among those who earn $30,000 or less. A third (33%) say jobs are plentiful while 58% say jobs are difficult to find in their community.